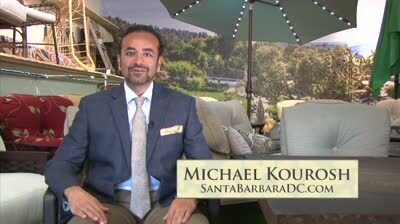 On this Season on Design Santa Barbara with Michael Kourosh we bring you back to the latest updates on designing your home. We are honored to have our talented set designer and local artist Lizabeth Madal Featuring furniture and designs from Cynthia Rowley with host Michael Kourosh. See how Lizabeth Madal designs beautiful vignettes with some of Cynthia Rowley’s best designer furniture. Learn expert tips with Lizabeth on how to approach creating a living spaces that are warm and welcoming on Design 411 with Michael Kourosh. Also check us out at Santa Barbara Design Center. We are proud to provide the greatest selection in town of the best items to add comfort and luxury to where you live. From one-of-a-kind antiques to sofas, sectionals, and chairs custom-made to your specifications, to lamps and lighting, to tables, to rugs, we have everything to fit your personal style. Come in with your own design specifications or allow our staff of professional designers to create a room centered around the most important person to use that room, you. In this Vignette lizabeth uses the Wallis Swivel Chair in a traditional Chesterfield-styled chair with high tufted arms and back, plus nailhead detailing. In a nod to modernity, Wallis is a swivel chair, offering comfort that’s all today. To compliment the swivel chairs was one of Cynthia Rowley’s extraordinary Sofas. Along with the furniture was the Horizon Line Rect Starburst Cocktail Table a Rectangular coffee table is a study in perfect symmetry with a twist: an off-center radiating sunburst on the tabletop. Amazing veneer work, and a lovely surprise. A couple other accents included was Serendipity Console Table which Stunning onyx stone top is a product of nature. No two will be quite alike. It seems to float atop an open tubular base beautifully gold leafed. Horizon Line Square accent U-shaped metal-plated bars form the table base, supporting a square top. At just 18 inches square this accent table is perfect for any room, any design plan. In this showroom siting area lizabeth set up with a Bewitch Nine-Drawer Mirrored Dresser which has a mirrored and gold-framed landscape finished with jewel-like hardware: opalescent stones set in reeded gold. Top drawers are velvet-lined for personal items and intimates. She then included the Twiggy Mirror which is a beautiful frame that is an asymmetrical network of twig-like metal dusted in gold. Organic meets sophisticated. Included was a Square Cocktail Table w/ Reversible with its framed in bold metal plate. The lower shelf is stationary. The tabletop is outfitted with flippable trays in a medley of cream and gold-leaf finishes. The little office area has The Side-Stripe Accent Writing Desk, finished with a sleek asymmetrical gold stripe whose trajectory wraps around the drawer front and desk back. Two drawers are finished with simple metal stud-like pulls. The desk was complimented with a beautiful Swanson Upholstered Metal Side Chair, the Swanky metal side chair channels Hollywood Regency styling with a curvaceous gold-leafed metal frame, upholstered seat and back rest, and posh sheepskin pouf on the seat. Last but not least a beautiful Morrocan rug to bring it all together and make it seem like home sweet home. Moroccan rugs are most famous for their dynamic color designs and bold geometric patterns. Today, the Moroccan rug is one the industry’s hottest design trend. Each piece is a sliver of history, a slice of true folk art, and is an heirloom that may be passed down for generations. CYNTHIA ROWLEY COMBINES A PERFECT MIX OF ELEMENTS TO CREATE THE MOST STRIKING EXPERIMENTATION OF MATERIALS AND TEXTURES. TAKE A VISUAL JOURNEY THROUGH HER LATEST CREATIONS FOR THE HOME AND GET READY TO BE INSPIRED. As a student at the Art Institute of Chicago years ago, Cynthia Rowley had every intention of becoming a painter. But as destiny had it, she received her break into the world of fashion when she was on a train from Chicago to New York City and her talent was discovered by a top department store buyer. The initial interest gave Cynthia the confidence to move to NYC, where she went on to win the Council of Fashion Designers of America’s (CFDA) award for Best New Talent, become a best-selling author and appear on TV shows such as Project Runway, Letterman and The Today Show and in numerous lifestyle and fashion magazines from Vogue to Elle Décor. Today, Cynthia Rowley is one of the world’s leading contemporary fashion designers, known for breaking boundaries and taking fashion in new directions. She’s also a style icon, taste maker and leading global lifestyle brand sold in over 60 freestanding collection boutiques, as well as department, specialty and online stores worldwide.